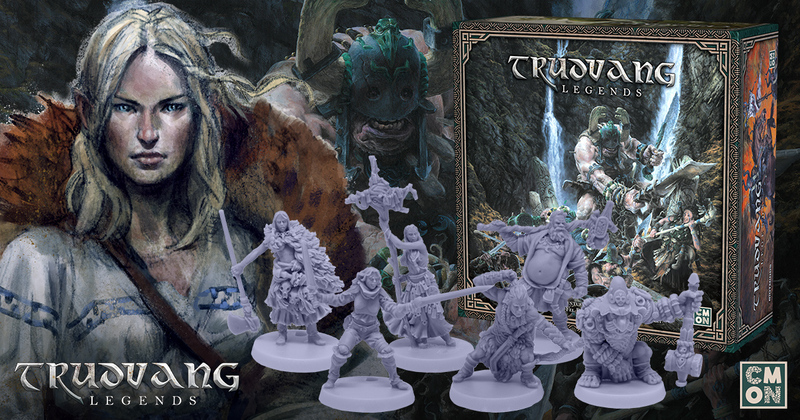 Friday, July 27, 2018 CMON Limited will be launching a Kickstarter campaign for Trudvang Legends, an upcoming storytelling board game based on the successfully crowdfunded Swedish RPG: Trudvang Chronicles. Steeped in epic Nordic and Celtic myths and sagas, players will take the roles of legendary heroes who make their mark on a dynamic, everchanging fantasy world. Trudvang Legends features incredible art from the original RPG by Paul Bonner and Alvaro Tapia and graphic design by Fabio de Castro. Heroes and monsters will be represented by highly-detailed miniatures sculpted by Juan Navarro Perez, Arnaud Boudoiron, Edgar Ramos, and Aragorn Marks.